Eight percent of tech industry employees are Hispanic and almost 7 percent are black, according to the census bureau’s American Community Survey. Hack.Diversity and the Startup Institute want to change this. 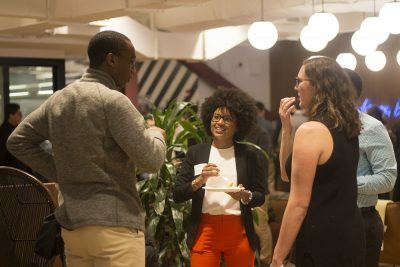 The Startup Institute held an event in Cambridge Thursday night to introduce its new partnership with Hack.Diversity, with the goal of connecting minority students with up-and-coming tech companies in the Boston innovation economy. The event was open doors, so anyone from the public could come and connect with students and alumni of the Startup Institute, hiring partners and local companies looking to recruit a more diverse workforce. Attendees could attend panels with industry professionals, work groups and breakout sessions to encourage the discussion of inclusivity in the workplace. Hack.Diversity recruits minority students graduating from two and four year colleges and places them in tech internships. The Startup Institute has a similar purpose but offers programs to professionals seeking to improve their skills in development, marketing, sales and design. Peggy Yu, chief operating officer at the Startup Institute, said the focus this year is on inclusion. Working with Hack.Diversity is one of their first steps in building a more diverse workforce. Yu said the company’s diversity initiative doesn’t stop at race. The institute wants to help people from different backgrounds in religion, socioeconomics, age and perspective, Yu said. They aim to figure out what it really means to live and breathe diversity inclusion. Various companies attended the event in hopes of having more meaningful conversations with a more diverse set of potential employees. Virginia White, people operations lead at Formlabs, a manufacturer of 3D printers, said her company is trying to have a greater outreach presence. “I think it’s easy to spend all of your time just flicking through resumes. But this year we’re trying to be a lot more proactive,” she said. Open Doors and other creative networking events encourage vital human interaction, Yu said. Her hope is for people come to more networking events to have meaningful discussions. “Especially in these kinds of charged environments, these events are so important, and they really bring people together,” she said. Mohamad Ali is the CEO of Carbonite, a cloud backup service. He said his company attended the event because of its emphasis on inclusion as well as its interactive programs. Ali said Carbonite is in its second year of collaboration with Hack.Diversity. In setting up minority students in internships throughout the city, Ali said, Hack.Diversity works to turn those internships into permanent positions. However, beyond diversity, most companies seem to look for a few universal values, such as a willingness to adapt and learn quickly. Ali said a candidate should be flexible, job-wise. “You should be able to wear whatever hat is given to you,” Ali said. Startup companies in particular are constantly evolving, Ali said, so candidates need to adjust and perform accordingly in a flexible environment. Yu said that for students interested in entrepreneurship, the journey is more important than the destination. It’s not enough to message someone on LinkedIn to express interest in a company. “You have to have that exchange of ideas in person. And then link up after,” she said. Above all, Yu said, students interested in Boston’s entrepreneurial tech scene should strive to make innovative thinking a part of their everyday lives.